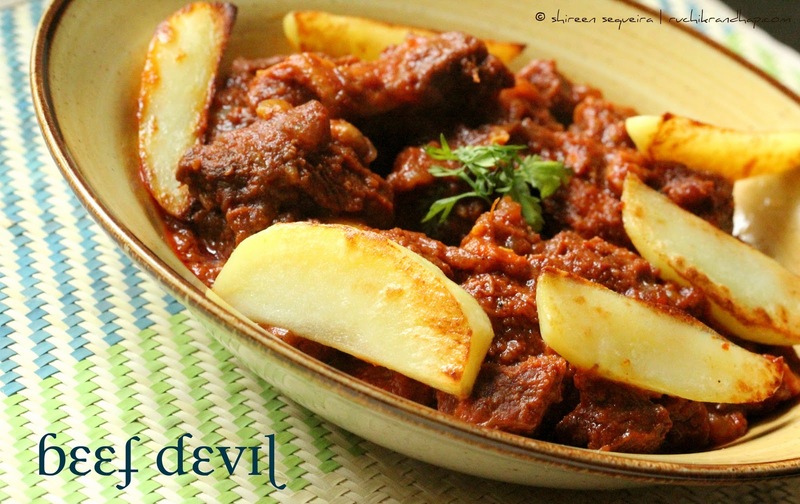 Beef Devil ~ Mangalorean Style + Video! There’s nothing like a peaceful routine – sometimes an uneventful a.k.a ‘boring’ day is all you need to unwind and smell the flowers and take it easy. Today is one such Sunday. While I am happily posting this recipe, R has taken over the kitchen, making his favourite Beef Sukka – love the way he prepares it. Our little one is busy with his crayons and munching his favourite snack whilst listening to his favourite Bollywood tracks on TV – already a multi tasker! After a lazy lunch and a siesta we will go to church in the evening and then head to the mall to pick up our weekly groceries. All in all a family day – doing everything in general but nothing in particular. So much better than the mad rush of a life I had a few years ago when I was working. 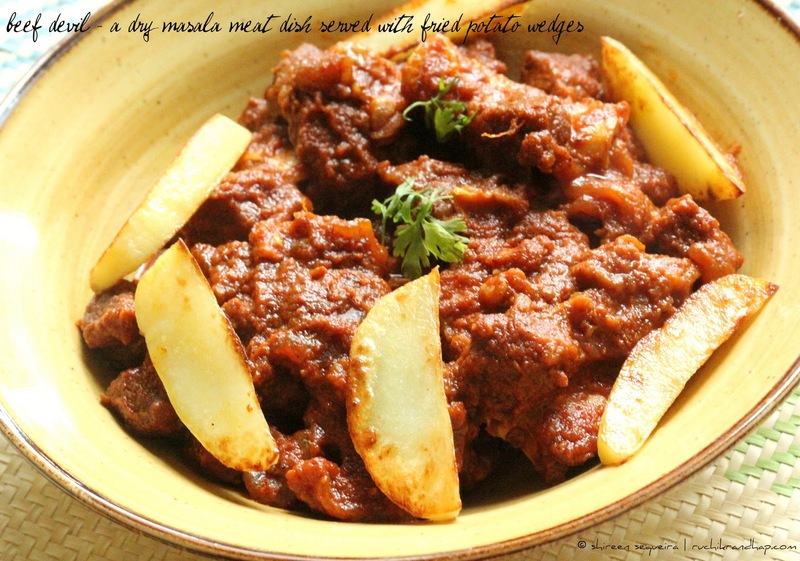 Well, today’s recipe is a typical Mangalorean style Beef dish which is originally listed as a Mutton preparation in probably one of Mangalore’s oldest and first recipe book authors – Mr. Isidore Coelho who has painstakingly put together over 800 recipes although not restricting to Mangalorean cuisine alone. It is one of the must haves on every housewife’s bookshelf and is like a Bible to every novice at cooking. My mum gifted me the English edition of this book lately although she owned the Konkani version for many years. I have tried many a recipe from this book and I’ll begin with this recipe which you can make with Mutton or Beef (I made it with Beef). It’s the perfect weekend recipe – a dish you can put together in no time, thanks to the pressure cooker. It tastes awesome when eaten with Chapathis or served with Rice & a simple Dal and some steamed Thel Piao (Mangalorean Oil & Onion stir fry style veggies) on the side. The fried potato wedges are an added attraction to this dish making it a filling meal. So this recipe is for all my friends who are looking for a typically Mangalorean style red meat recipe and have been a little disappointed to find only vegetarian recipes lately. I hope to clear my backlog of non vegetarian recipes soon especially some fish & chicken recipes. Do watch this space for more! Cut the meat into medium size pieces, wash and allow to drain on a colander. Wash and peel the potatoes, cut them into thin wedges, apply some salt to the wedges and keep the vessel a bit slant so that excess water gets drained. Grind these ingredients to a fine paste using a little water - dry red chilli skins, peppercorns, cumin, turmeric, ginger, garlic, green chilli, tamarind, almonds, raisins, onions, cloves and cinnamon. Retain the masala water (from the mixer grinder). Grind the tomatoes separately - keep this purée aside. In a pressure cooker heat some oil or ghee and fry the sliced onion till it turns slightly golden in colour. Add the ground masala and fry for a few minutes and then add the tomato purée, fry a little and add the masala water. Fry on low fire for about 5-7 minutes, stirring every now & then. Cover the pressure cooker with the lid, place the weight (whistle) and cook on full flame till the first whistle goes off (should take about 7-8 minutes). 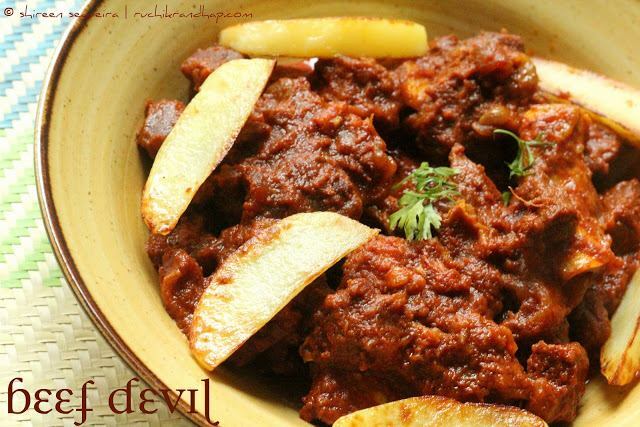 Reduce the flame completely and cook for a further 13-15 minutes (if you are cooking tender Mutton) or 20-25 minutes (if you are using tender Beef). You may need to cook for an extra 5-7 minutes if the meat is not tender - please use your discretion. Turn off flame and wait for the pressure to get released on its own (whistle becomes loose). Open the lid, mix well. Omg, seriously am drooling over that delicious mutton devil..
Do you know my blog header is from Isidore Coelho's "The Chef"? 😉 I have to yet write down the reason behind it.. Superb Shir! Drooling as I type this comment. ooh what a wonderful mix of masalas. I have added cashews but never tried with almonds and raisins.next time I get mutton I am gonna make this for sure. I always add vinegar/ lime to mutton to tenderize it. instead of mutton or beaf can i add chicken? Hi Sonia, well, if you are using Chicken, you may need to reduce the spice as the amount mentioned goes well with tougher meats like beef & mutton. Also, cook the Chicken in a regular pan instead of a pressure cooker. All the best! The Chef is a brilliant book- it has now served two complete generations.My Mom got it as a present from her Aunt at her wedding – I took the book along during my studies and now I still use it as a married person- 30 years later! Brilliant recipe by the way – will definitely try this! Def a devil disguised! Sounds awesome …will surely try it. Thanks so much for the feedback Ramona!! Sorry for the late reply!! So glad u liked it!! i tried this devil of yours way back in December. whatta taste and whatta colour. needless to say we all relished it. Hi, I tried this recipe and it turned out delicious. I added coriander to the masala as I like coriander/cilantro's smell and taste. What I like about this wonderful blog is consistency (explanation, pictures, neatness) across recipes. You really need dedication for this. Thank you very much. Happy cooking! @Anonymous: Thanks a ton for your feedback! Your compliments mean a lot to me and help me keep going! So glad you enjoyed this recipe! Do try some more and let me know how you liked them! So glad to hear that Lynn! Happy to know that my pressure cooking instructions were helpful! !